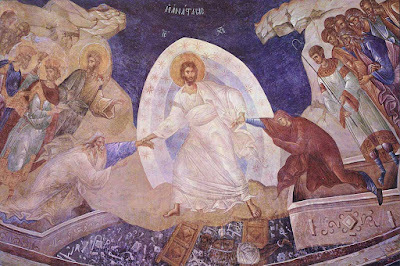 "As the evil one procured our twofold death by means of his single spiritual death, so the good Lord healed this twofold death of ours through His single bodily death, and through the one resurrection of His body gave us a twofold resurrection. By means of His bodily death He destroyed him who had the power over our souls and bodies in death, and rescued us from his tyranny over them both. The evil one clothed himself in the serpent to deceive man, but the Word of God put on man's nature to trick the trickster." - St. Gregory Palamas, "Homily for Holy and Great Saturday"
Genesis begins with the account of the creation of the first-formed Adam and Eve, and records their disobedience to God by eating the forbidden fruit from the Tree of the Knowledge of Good and Evil. When the Lord confronted them regarding their disobedience, and gave them an opportunity for repentance, they refused to put the blame on themselves, incurring a curse from God and banishment from the Garden of Eden. As they were being banished, we read in Genesis 3:21: "The Lord God made garments of skin for Adam and his wife and clothed them." 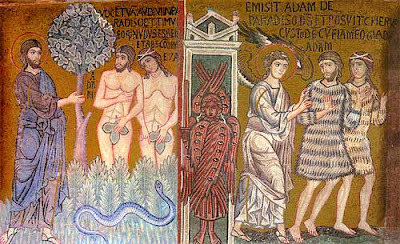 No longer were Adam and Eve "clothed" in the uncreated light of God and thus protected from the elements, but their disobedience made them realize their purity was gone and they were left naked and exposed to the elements. God, however, in His goodness, provided for them with lowly earthly garments made of animal skin. Just as someone who enjoys special favor from the king is clothed in royal and expensive garments, but after some sort of disobedience or betrayal is stripped of such garments and made to look like a slave, so also were Adam and Eve. Their clothing, from now on, was to be a constant reminder of their disobedience and the loss of their purity. 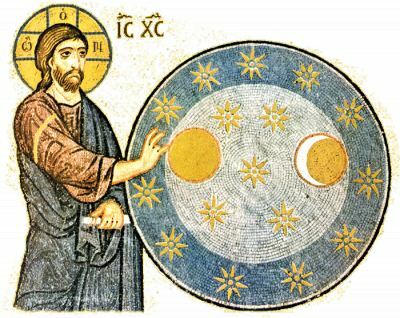 In his homily on creation titled Hexaemeron (“On The Six Days”), where he analyzes the Old Testament narration of Creation, Basil the Great promptly stresses that the narration purposely lacks many details, in order to exercise and sharpen the readers’ minds, so that with the few details provided, they might seek out the rest (PG 29, 33B). He furthermore stresses (and this is more important) that, even if mankind discovers the way in which God created all things wonderful, it would in no way diminish our admiration of God’s grandeur. Basil the Great here introduces two basic principles, as prerequisites for interpretation: (a) the freedom of scientific research, which is also an exercise of the mind and (b) the distinction between WHO made the world and HOW the world was made. In other words, it is one thing to theologically “know” that God created the world, and a totally different thing to “seek” the ways that all these wonders came to being. In the second instance, we acknowledge scientific “seeking” as the means to describe and analyze the data of all created things, and of course not the means to describe or analyze the uncreated divine energy.